We always knew American Horror Story: Apocalypse would bring back the Coven witches. Creator Ryan Murphy teased from the beginning that this season would crossover with both Murder House and Coven. The premiere made good on the Murder House portion, bringing back Michael Langdon, son of Tate Langdon and Vivian Harmon, and the literal Antichrist. Michael reigned terror over the first three episodes of Apocalypse, terrorizing the elite survivors of a nuclear event he orchestrated that wiped out most of the world's population. But where were the witches? Luckily, Cordelia Goode (Sarah Paulson), Myrtle Snow (Frances Conroy), and Madison Montgomery (Emma Roberts) turned up in the final moments of Episode 3, "Forbidden Fruit," arriving at Outpost 3 to revive their "sisters." Three of the women who survived the nuclear blast were actually witches the whole time: spoiled brat Coco St. Pierre Vanderbilt (Leslie Grossman), her assistant Mallory (Billie Lourd), and talk show host Dinah Stevens (Adina Porter). Coco and Mallory were put under identity spells to forget their witchy abilities; they're members of the Salem-descended coven, while Dinah is part of Marie Laveau's voodoo tribe. It was thrilling to see how the seemingly new Apocalypse characters tied back to Coven, but their true identities weren't the only magical surprise Episode 4, "Could It Be… Satan?" had in store. We were also introduced to a whole new branch of magical practitioners: warlocks! 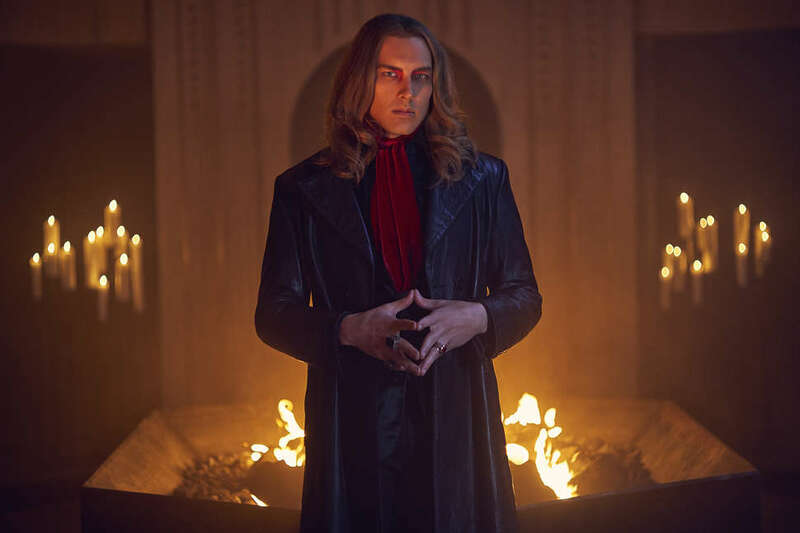 Bringing warlocks into the American Horror Story fold expands the show's mythology in vast, exciting new ways, and lends a whole new shade of grey to Michael Langdon. Here's what we learned about the warlocks in "Could It Be… Satan?" and what role they could play in Apocalypse's main arc. In Coven, we spent a lot of time in Miss Robichaux's Academy for Exceptional Young Ladies, a witch school run by Cordelia. In "Could It Be… Satan?" we learn that a similar school existed for warlocks: Hawthorne School for Exceptional Young Men, which, after the apocalypse, was refitted as Outpost 3. The underground school was run by a council of warlocks -- played by BD Wong, Cheyenne Jackson, Billy Porter, and Jon Jon Briones -- who taught magical arts to a robust student body. Hawthorne went underground after Cordelia went on a showy publicity tour, exposing the world to magic and opening the doors of Robichaux to witches in hiding. There seems to exist some competition between the witches and warlocks, which is made more clear when Michael Langdon catches the attention of Hawthorne's council. Hawthorne's Grand Chancellor Ariel (Briones) is made aware of a young Michael Langdon three years before the apocalypse takes place, after Michael was arrested for assaulting a grocery store butcher. Ariel shows the council video footage of Michael being questioned by a police officer, who he maims and disfigures and eventually kills with his mind. Ariel has reason to believe that Michael could be the "Alpha," a warlock who, according to prophecy, would supplant the Supreme in magical hierarchy. After recruiting Michael to the school and testing his powers, the council agrees that he's significant and want to further probe his capabilities. That's when they call on the coven, inviting Cordelia, Myrtle, and Zoe Benson (Taissa Farmiga) to Hawthorne for a special meeting. When the witches arrive, the warlocks reveal their suspicion that Michael could be the Alpha, and want Cordelia to test him on the Seven Wonders, a series of magical abilities that only a Supreme can fully master. Cordelia refuses, citing her fear of killing Michael in the process. She also scoffs at the idea of an Alpha, stating that witches are historically and physically known to be stronger than warlocks, because "testosterone impedes access to the ethereal realm." Cordelia assumes the warlocks are jealous of being lesser than a group of women, and leaves Hawthorne with Myrtle and Zoe. But the three of them are stopped when another trio of magic-doers approaches: Michael, and the very dead Madison and Queenie (Gabourey Sidibe). Cordelia faints. When probed by the Hawthorne warlocks, Cordelia reveals that her greatest fault as Supreme was her inability to save Queenie from the Hotel Cortez, where she died. Despite her best efforts, Cordelia couldn't help Queenie escape from the hotel's purgatory, and so she was trapped there forever. But Michael, overhearing this, sets out to do what Cordelia could not. He travels to the hotel and effortlessly gets Queenie out of its clutches. The two also make a pit stop in Madison's personal hell, where she was trapped after her death at the end of Coven. With the two irretrievable witches retrieved, Michael heads back to Hawthorne and intervenes Cordelia's departure. She faints at the sight of the girls she couldn't save. Michael's abilities are stronger than any we've seen before, unparalleled even by Cordelia or her Supreme mother, Fiona (Jessica Lange). The audience is aware that Michael is the Antichrist -- as warned in Murder House, the Antichrist would be born of ghost and mortal, which Michael was -- but the witches and warlocks aren't. To them, Michael is the fulfillment of the Alpha prophecy. But if the Alpha supersedes the Supreme, rendering her role moot, wouldn't that make him both the Alpha and the Supreme? Or maybe his role as Antichrist is something else entirely. Maybe he isn't the Alpha or the Supreme, and is instead an almighty force neither can touch. His powers may look like that of a warlock, but as one of the council members, John Henry Moore (Jackson), points out, Michael's magic feels "different" and "darker." The ability to raise souls from Hell is a magic witches and warlock are not known to possess. If Michael's Antichrist magic puts him in a league of his own, who could possibly stop him? We're guessing the witches and warlocks team up to take Michael down, but even they might not be powerful enough to overthrow the Antichrist. If they can't do it, who possibly can? There's another nugget of information in Episode 4 that might hold the answer to that question. Before Cordelia and Zoe are summoned to Hawthorne, we visit them briefly at Miss Robichaux's. Zoe is teaching a group of young witches how to change the color of flowers. As the witches cast their spells, Zoe points out one of the students to Cordelia: It's Mallory, before her identity spell, transforming a white rose to a blue one. Cordelia doesn't see anything out of the ordinary, but Zoe gestures again. Mallory's rose withers, and the petals turn into butterflies. This, too, is a different kind of magic than what we've seen before. It's strong, but beautiful and pure. Mallory's immense power was hinted at in Episode 3, before her true identity was revealed. When Michael questioned her in his lair at Outpost 3, she terrified him by blasting him across the room with her mind and manipulating the fire in his hearth. So far, she's been the only person to challenge him physically and magically. Who, or what, is Mallory? It's hard to say just yet, but she appears to be some kind of angel. That would explain why she scares an evil Michael, and why her magic is so exceptionally beautiful. The show seems to be positioning these two as opposite forces, the Big Good and Big Bad of Apocalypse. How this turns out is anyone's guess, but we're keeping our eye on Mallory. Lindsey Romain is a writer and editor living in Austin. She covers politics for Teen Vogue and has also appeared in Vulture, Birth.Movies.Death, and more. Follow her on Twitter @lindseyromain.